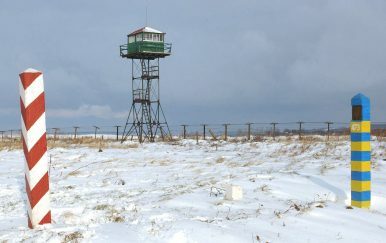 The remains of the old Soviet border barbed wire fencing and watchtower seen on the Polish-Ukrainian border, southeast Poland, Dec. 14, 2007. Tucked away in a pine forest on an unmarked road 40 kilometers from Warsaw is the Linin Refugee Center, a former socialist military housing complex that has been converted into accommodation for families of asylum seekers from Russia, Afghanistan, Iran, and more recently Tajikistan. Due to the Tajik government’s mass crackdown on perceived political opponents and dissidents, both inside and outside the country, hundreds of Tajik citizens have sought international protection in the European Union, with Poland acting as the main point of entry. Almost three years after the 2016 spike in asylum applications from Tajikistan, most Tajik asylum seekers are still struggling to gain refugee status in the EU. Nazira, who requested we not use her real name, is a Tajik woman in her early 30s and a resident at Linin. She is one of over 800 Tajik asylum seekers who crossed into Poland in 2016. Her long and harrowing journey to the Linin Refugee Center is revealing of the travails Tajik asylum seekers experience upon arrival in the EU. Despite witnessing some of the horrors of the Tajik Civil War as a child, Nazira had never entertained the thought of leaving Tajikistan. As a young woman, Nazira married a member of the Islamic Renaissance Party of Tajikistan (IRPT), who ended up abusing her both verbally and physically during their seven-year marriage. After successfully obtaining a civil divorce, Nazira gained custody of their two daughters and moved in with her parents. She continued to be blackmailed by her violent ex-husband, who refused to pay child support and threatened to take away the children by force. While her brother-in-law was a visible member of the IRPT, Nazira had never really been politically active. She was more concerned about protecting her family from harassment by her ex-husband than persecution by the Tajik authorities. “One day, as I was walking home from the pharmacy where I used to work in Dushanbe, a car pulled up next to me and a group of men in civilian clothing dragged me inside,” she told The Diplomat. After being taken to an unknown location, she was shocked to find herself in a room with other women who – like her – were wearing hijabs. Accused of being a terrorist simply for wearing a headscarf in public, Nazira was interrogated and beaten by what she believes to have been Tajik security forces. Upon her release, Nazira decided it was no longer safe for her to remain in the country. In exchange for forfeiting her rights to all future child support payments, her husband reluctantly signed papers allowing her to take their two daughters out of the country. In 2016, Nazira managed to cross into Poland with her children to join her sister and brother-in-law, who had escaped Tajikistan a few months prior. After settling into an apartment in a Warsaw suburb and enrolling her two daughters in school, Nazira arranged for her parents to join them in Poland after her ailing father suffered a microstroke as a result of torture by Tajik police who wanted to know Nazira’s exact whereabouts. Shortly after the family had successfully reunified in Poland, Nazira received a letter that her asylum claim had been denied. Fearing imminent deportation to Tajikistan, Nazira and her entire family relocated to Germany where they spent four months, first in a reception center and then – after German authorities had deemed their asylum application inadmissible based on their existing asylum case in Poland – in a pre-deportation camp. On the night of their deportation from Germany, her mother felt ill on the drive to the Polish border, but was not offered any medical treatment until they had crossed into Poland, where doctors at the nearest hospital ascertained that her mother had suffered a stroke. Since their traumatizing deportation to Poland, Nazira and her family have been living at the Linin Refugee Center. Although Linin is informally referred to as an “open camp,” there is nowhere to go within walking distance and Warsaw is extremely difficult to reach by public transportation. The center is surrounded by a wall and the reception center enforces a nightly curfew. Visitors are only allowed upon prior approval from the Polish Ministry of Interior and there is a police van parked outside the main gate around the clock. Like all other asylum seekers residing in Polish reception centers, Nazira receives a monthly cash allowance of just 70 Polish zloty ($18), but that money goes almost entirely to cover public transportation costs. While her second asylum application is under consideration, Nazira is required to sign in with an asylum officer in person at the Office for Foreigners in Warsaw twice a month, a two-and-a-half-hour trip by bus each way. While life in the reception center remains difficult, Nazira’s two daughters are doing very well in a nearby school and are already fluent in Polish. Although her prospects for receiving asylum remain bleak, Nazira hopes to be able to stay in Poland on humanitarian grounds given the poor health of her parents and her children’s integration into Polish society. While Nazira and her family were placed in a so-called open camp, other Tajik deportees from Germany have been even less fortunate. Mukhammadkholid Kuzov and Mullokhusein Abdulazizov, two cousins in their mid-20s, were also deported from Germany to Poland, but were both deemed a flight risk by a Polish court and placed in a closed detention center in Bialystok, where they have been locked up for the past 13 months. Though neither of the two cousins has any connection to Tajik politics, they happen to be the nephews of Mirzorahim Kuzov, a senior member of the IRPT whose arrest in Athens, Greece based on an Interpol red notice issued by Tajikistan caused an international scandal. Shortly after his uncle left the country in 2015, Mukhammadkholid came under increasing pressure from the Tajik police, who interrogated him on multiple occasions and threatened him with imprisonment if he didn’t provide information on his uncle’s political activities. Despite the fact that Mukhammadkholid had never been particularly close to his uncle growing up, seeing the mounting intimidation campaign against relatives of prominent Tajik politicians pushed him to first lay low in Russia for a few months before managing to cross into Poland on his third attempt. Whereas Mukhammadkholid grew up in Dushanbe, Mullokhusein left Tajikistan as a child and has little connection to his home country, having spent his entire adult life in Iran. In 2017, he decided to join his uncle at the annual OSCE conference on human rights in Warsaw, where he was informed that his personal safety in Iran could not be guaranteed. After trying to apply for asylum in Germany, Mullokhusein was deported back to Poland based on the fact that he had entered the EU on a Polish visa. After court proceedings where he was not provided with a lawyer, Mullokhusein was placed in the same detention center as his cousin, with whom he now shares a room. Mukhammadkholid and Mullokhusein are currently trying to contest their detention with the help of a Polish lawyer, but have no clear timeline on their release. While behind bars, Mullokhusein has dedicated most of his time to writing down the stories of other detainees, which he hopes to publish upon his release. “As horrible as it is to be cut from the outside world, this detention experience has inspired me to become a writer,” Mullokhusein told The Diplomat. Mukhammadkholid, who already speaks Polish and had been enrolled in a Warsaw vocational school prior to receiving his negative asylum decision, would like to stay and study programming in Poland if he is allowed to move back to Warsaw. The Tajik government’s ongoing campaign of reprisals against political opponents may have started with prominent members of opposition parties, but has since evolved into a witch hunt against anyone with personal or professional ties to dissidents and opponents of the regime. Having a friend or relative voicing criticism of the Tajik government can be grounds for one’s own arrest. Whereas well-known members of the political opposition can provide documentary evidence of their political involvement in an asylum court, their relatives, acquaintances, and business associates often end up in the crosshairs of Tajik security services, but are then found to not have sufficient grounds for asylum in Europe due to their lack of actual political involvement. To make matters worse, access to legal aid for asylum seekers in Poland has become a significant hurdle as a result of the current Polish government’s unwillingness to accept EU funding destined for legal aid. Without access to EU money, Polish NGOs have been forced to let go most of their legal staff, leaving asylum seekers forced to rely on public defenders who have neither the resources nor the time to provide adequate legal assistance. Recent political developments in Poland do not bode well for Tajik asylum seekers arriving in the country. The Polish Ministry of Interior is set to introduce controversial changes to Poland’s asylum law that would require all asylum seekers who apply at the border to be placed in closed detention centers where they would undergo a fast-track asylum procedure. While Polish and international NGOs have qualified these changes as “serious infringements” of migrant rights and existing international law, including the Geneva Convention, there is a very real possibility that the current Polish government could still put these new measures into place in the coming months. As the Polish border guards continue to deny asylum seekers the right to apply for asylum at the border, some Tajiks have sought to avoid Poland altogether. Lithuania is emerging as an alternative entry point into the EU space. While the number of Tajik asylum applicants in Poland dropped from over 800 in 2016 to just 120 in 2018, Lithuania has seen an increase in arrivals from Tajikistan, from 20 registered cases in 2016 to 120 in 2018. Access to Lithuania, however, remains difficult as Lithuanian border guards have also engaged in pushbacks of asylum seekers. The country recently lost a case in the European Court of Human Rights for preventing a Chechen family from applying for asylum at the border. Facing obstacles to protection in Europe and continued persecution in Tajikistan and Russia, many Tajik families have found themselves scattered across the EU, Turkey, Ukraine, Belarus, and Moldova without any clear prospect of reunification. While many Tajik asylum seekers initially attempted to find protection in Western Europe, some have grown fond of Poland, characterizing it as a more familiar place due to a perceived common socialist heritage. As of yet, Polish authorities have refrained from sending back rejected Tajik asylum seekers due to the complicated logistics and high costs associated with deportation to Tajikistan. With the rapid expansion of Frontex, the EU’s common border police, the Polish government may be simply waiting to outsource involuntary returns to the EU, leaving the Tajik community in Poland in a state of agonizing uncertainty. Given the recent kidnapping of political activist Sharoffidin Gadoev, who had received refugee status in the Netherlands, it is not difficult to imagine the kind of persecution those deported back to Tajikistan may face upon return. A crackdown in Tajikistan has led to a little noticed surge in Tajik asylum seekers in Europe -- particularly Poland.